Each year I meet hundreds of instructors and librarians excited about the idea of bringing our Wikipedia assignment into their classes. Sometimes it’s an easy conversation about upcoming courses, updating syllabi, and designing the right project to achieve learning objectives. Other times, the conversation is a bit harder – what if someone is excited about the project but isn’t teaching in the near future? Or doesn’t have a course at the moment suited for this assignment? That’s where hosting Wiki Education for an online workshop or webinar comes in. 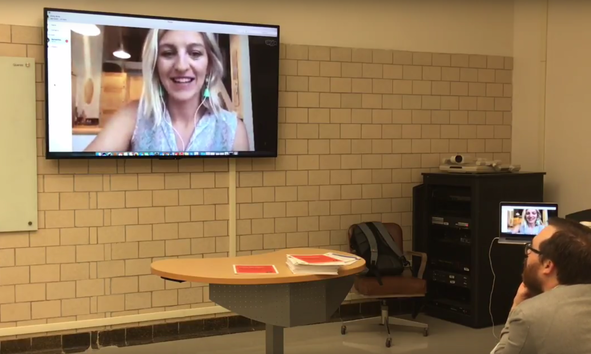 Samantha Weald joins remotely to present to instructors at Louisiana State University about the benefits of teaching with Wikipedia. Instructors and staff interested in the project can host these events so that others on campus can get involved. And just last week, I ran two similar events for universities interested in learning more about Wiki Education, our work, and the details of what it means to “teach with Wikipedia.” The first with a graduate level course at George Mason University, where students were interested in “Higher Education in the Digital Age” and how Wiki Education’s work promotes open access, OER, and and digital literacy. The second with a group of instructors at Louisiana State University interested in implementing these assignments within their research and writing courses. At each event, I presented information about Wiki Education and showcased our Dashboard tool (which provides students with online trainings, assignment templates, and more; and helps instructors track the work their students do on Wikipedia). I answered questions about Wikipedia, Wiki Education, and anything else that was on attendees minds. Thanks again to George Mason and Louisiana State for hosting me last week. I look forward to moderating more of these events in the coming months! To host a webinar or learn more, email us at contact@wikiedu.org.